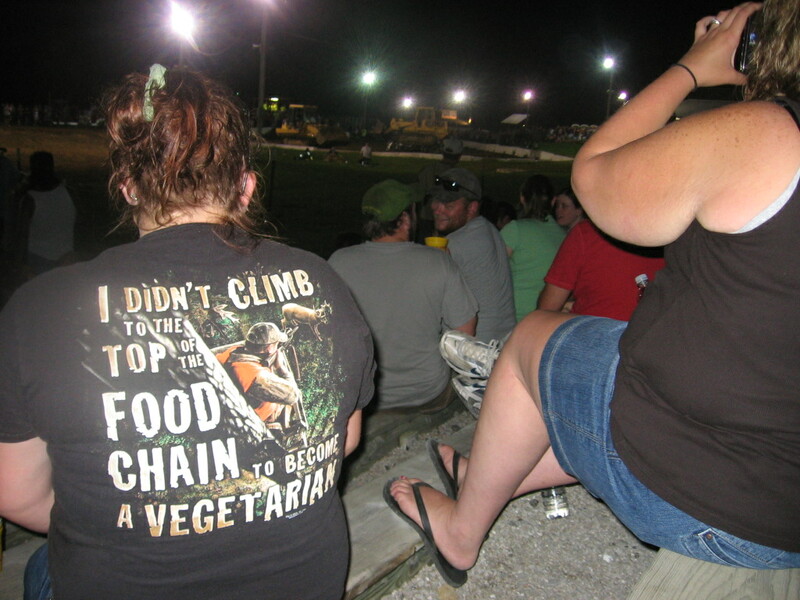 Oh, the St. Charles County Fair. Where culture meets corn dogs. Where the family tree starts to resemble said corn dog. For the 12 years that I've lived in St. Louis I haven't missed one demolition derby and my massive purchase at the corn dog stand is enough to keep their business afloat for the next 364 days. I must say, though, that this year was the most memorable. Literally. I've never actually gone to one of these things sober and it was like experiencing it for the first time. Yes, Elizabeth's shirt says "No Money No Honey." And she means it. You can't see it from the photo, but I'm actually on the phone with our life insurance agent right now. I'm pretty sure that riding anything constructed with a spare tire and dog leash automatically increases our premium. Perhaps the most disturbing element of this photo is the sign on the wall that says "no dogs allowed". So much truth -sniff-. This shirt just says what everyone else is thinking. That it's harder than you think to recover from The Gout. ha! You leave me speachless....most often it's because i'm crying through the laughter! Sorry I missed it - a corndog sounds deelish right now! Oh Amy you have no idea. 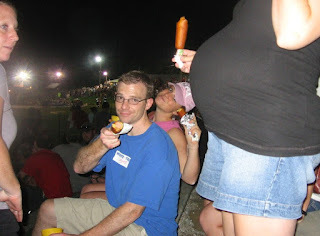 Corn dogs are God's gift to pregnant women. Oh, I know and I was quite serious when I said that it sounded delicious right now....it's like Jello - there's ALWAYS room for it!